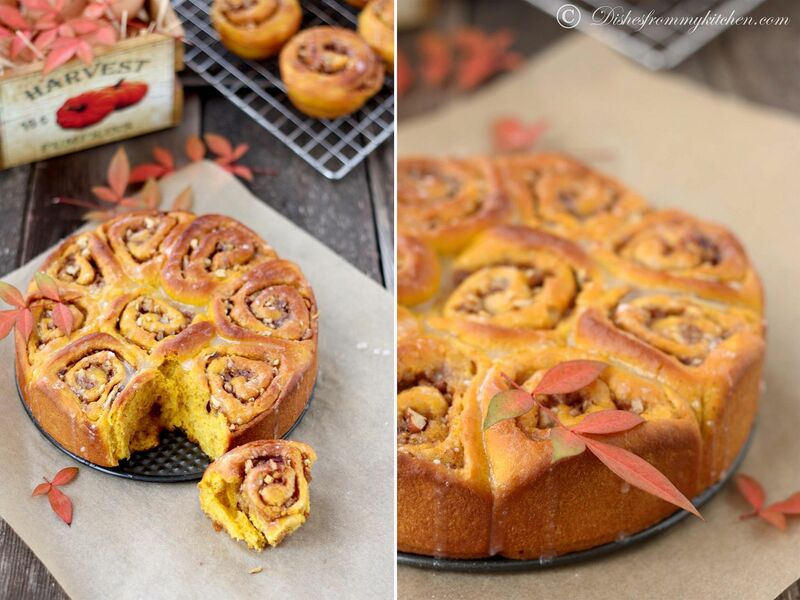 Dishesfrommykitchen: PUMPKIN CINNAMON ROLLS ! 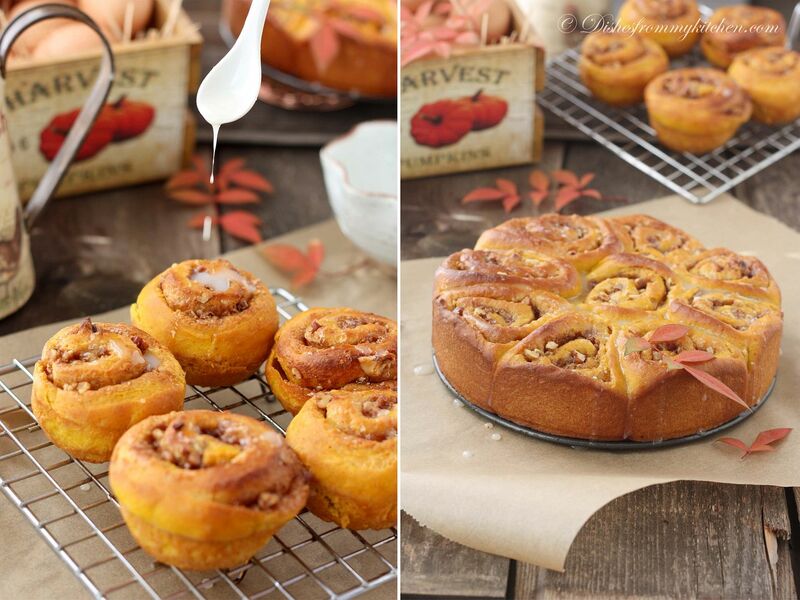 Mix icing sugar and warm milk together when you are ready to glaze the rolls. 1. Take all the dry ingredients in a bowl. 2. 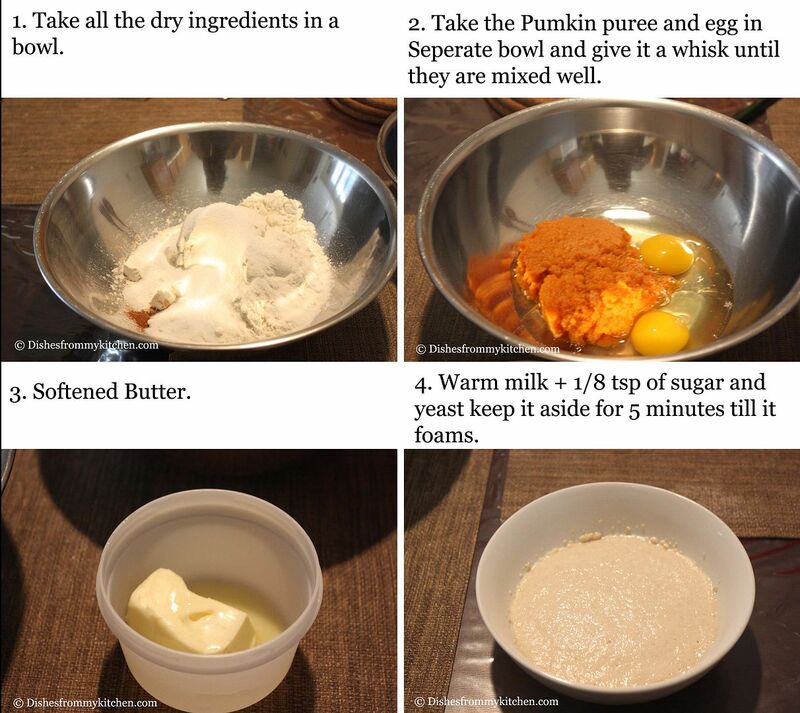 In a separate vessel combine pumpkin puree and egg whisk till they are mixed well. 3. Warm the milk add yeast and 1/4 tsp of salt to activate the yeast. Keep it aside for 5 minutes until yeast foams. 4. Now mix all the ingredients in the dry ingredients bowl. Knead manually or using stand mixer slowly for about 10 minutes. 6. Now oil or butter the vessel and keep the dough. Set aside for 1 to 1 1/2 hrs until it is double the size. 7. Mix the brown sugar, cinnamon and chopped nuts in a bowl and keep it aside. 8. Once the dough is raised. Flour the working space with little flour. 9. 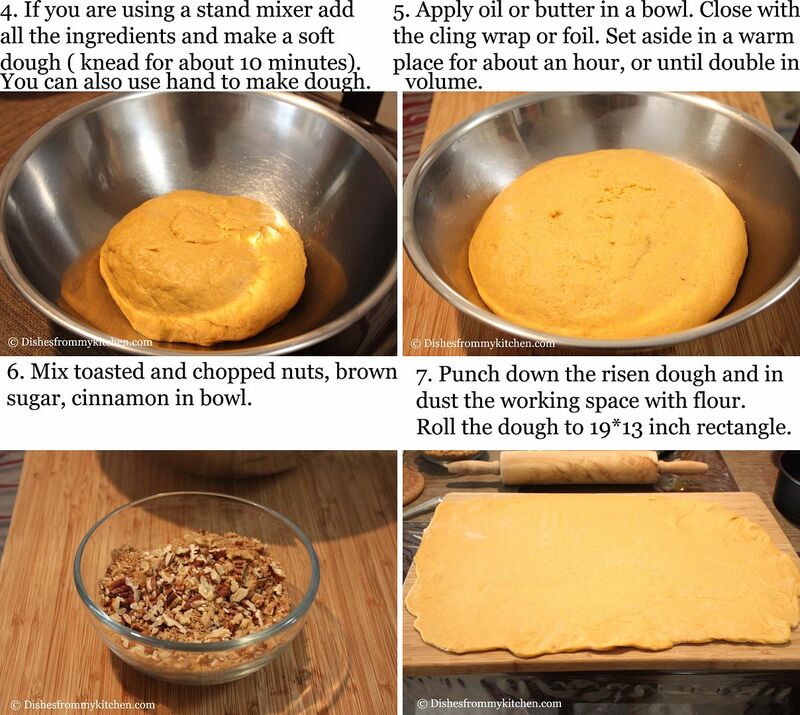 Roll the dough to 19 * 13 inch rectangle. 10. 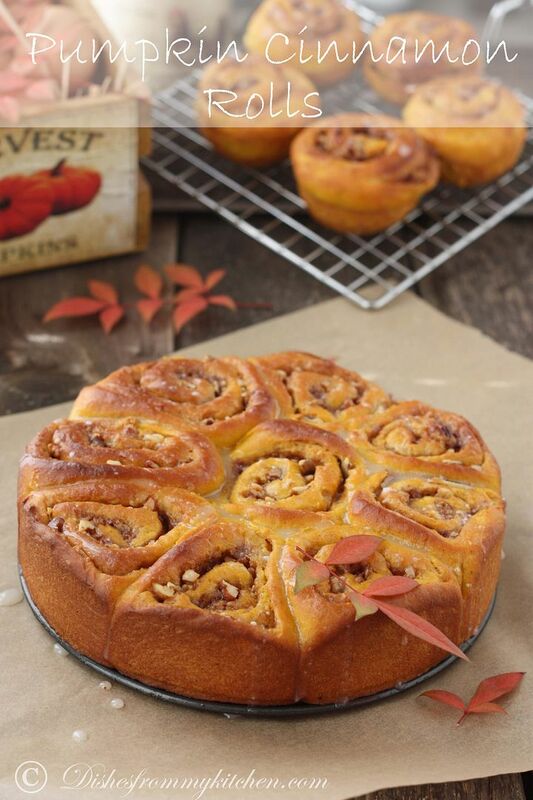 Smear the butter all over and sprinkle the brown sugar mixture. 11. Roll it from one side towards the end like a roulade. 13. I usually remove both the ends as there will not be much brown sugar mixture. 14. Now cut them to 16 equal parts. 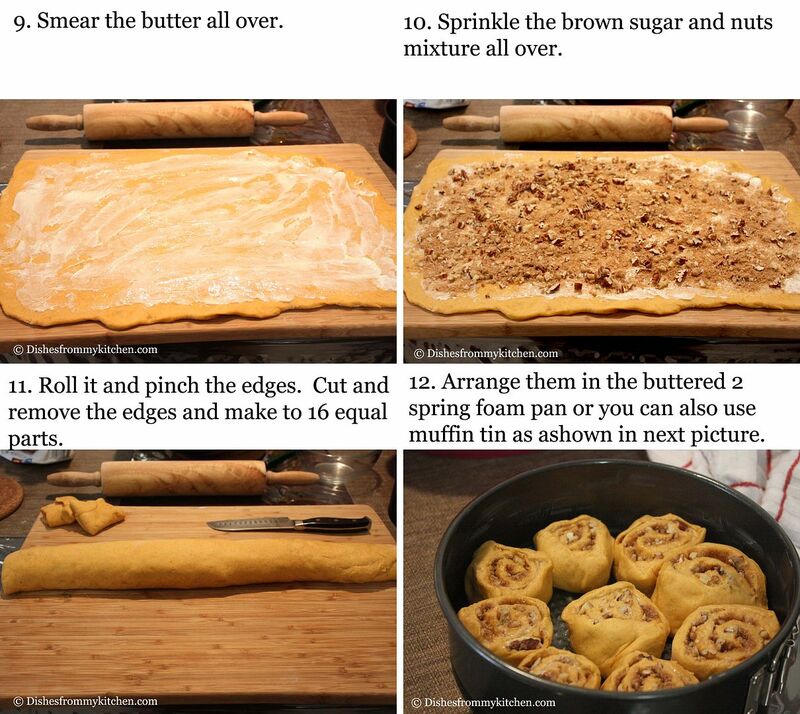 Arrange them in buttered square pan or any springform pan. 15. 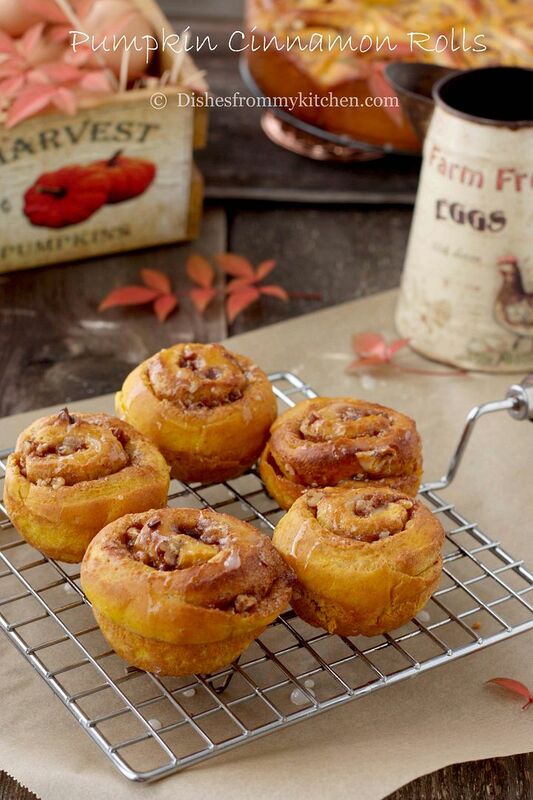 You can also use muffin tin for individual rolls. 16. Close them using cling wrap and keep it aside in warm place. 17. Let it double in size again(it takes 45 minutes to 1 hr depends on the weather). 18. 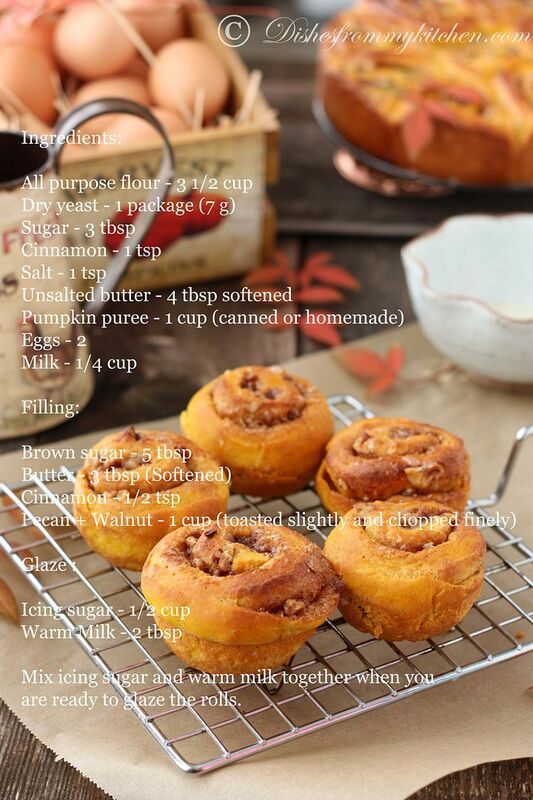 Now bake them in the preheated 350 f oven for about 15 to 17 minutes or until they are lightly browned on the top. 19. 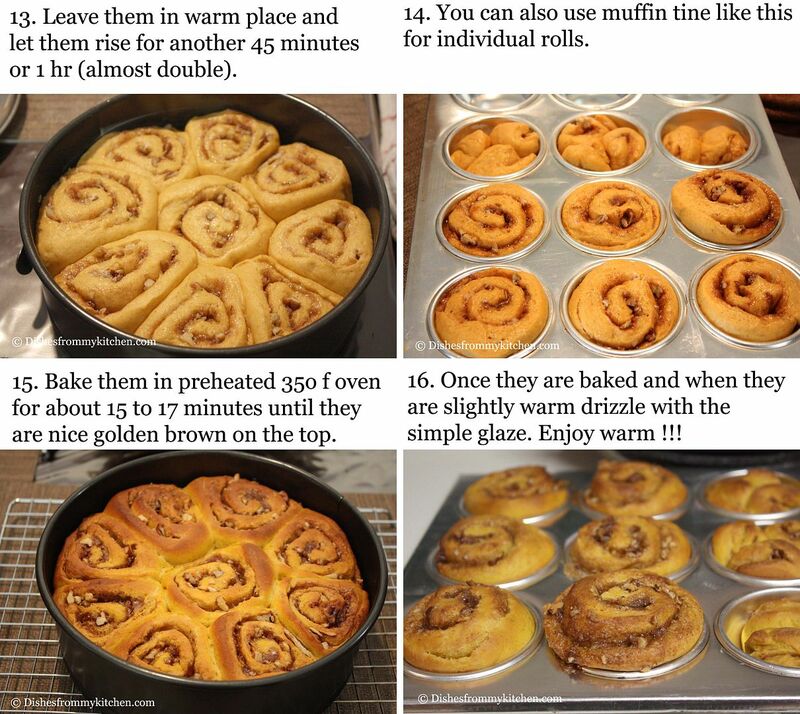 For the rolls in the muffin tin it takes 3 minutes lesser time for baking. 20. When it is slightly warm drizzle with the glaze. 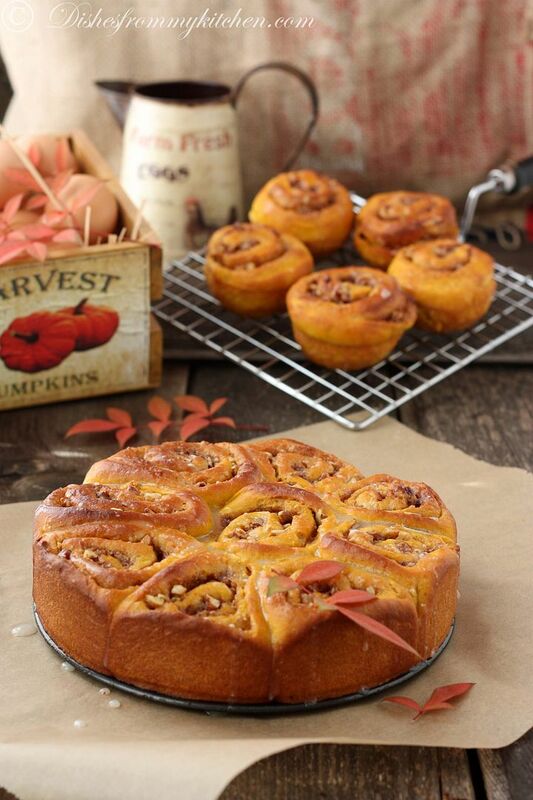 Enjoy warm Pumpkin cinnamon rolls !!!!! Absolutely delicious. 1. You can store this in room temperature for upto 2 to 3 days. 2. Just warm in the microwave when you are ready to eat. 3. 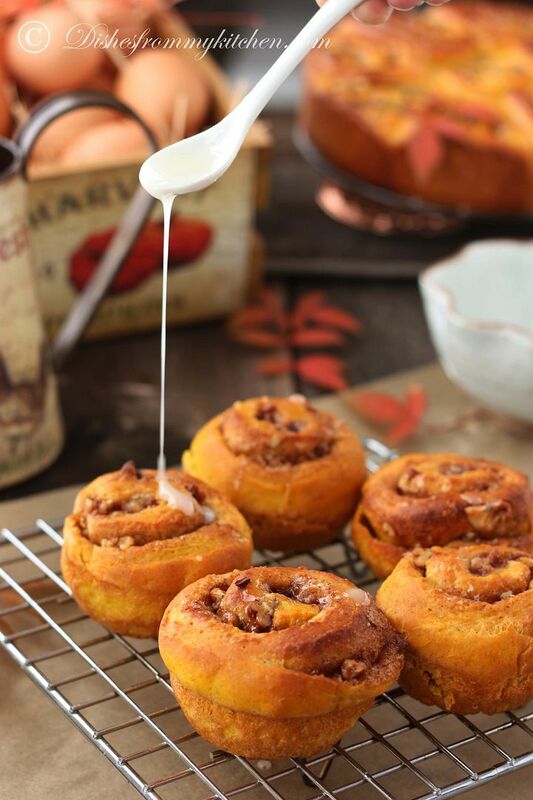 You can also use cream cheese and butter glaze, brown sugar glaze for this Pumpkin cinnamon roll. But I wanted to keep it really simple. 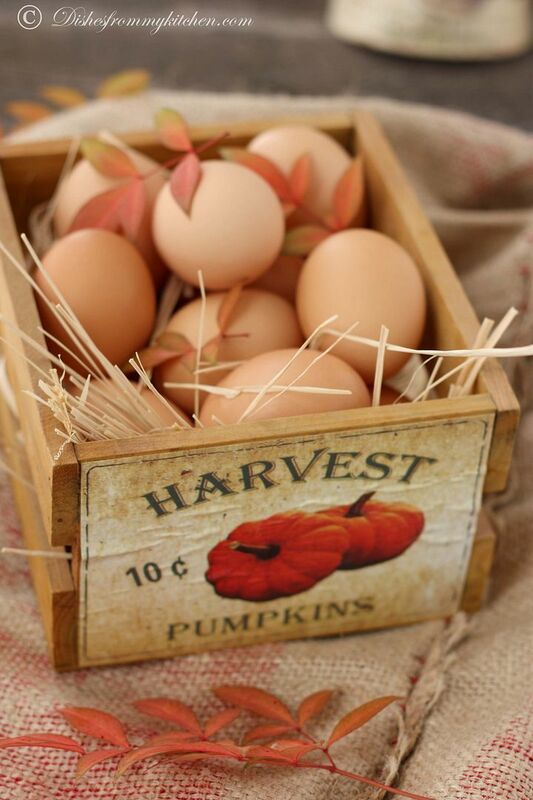 Love the clicks and the props..Btw, do i get a prize because I guessed that you were baking bread :) ???? 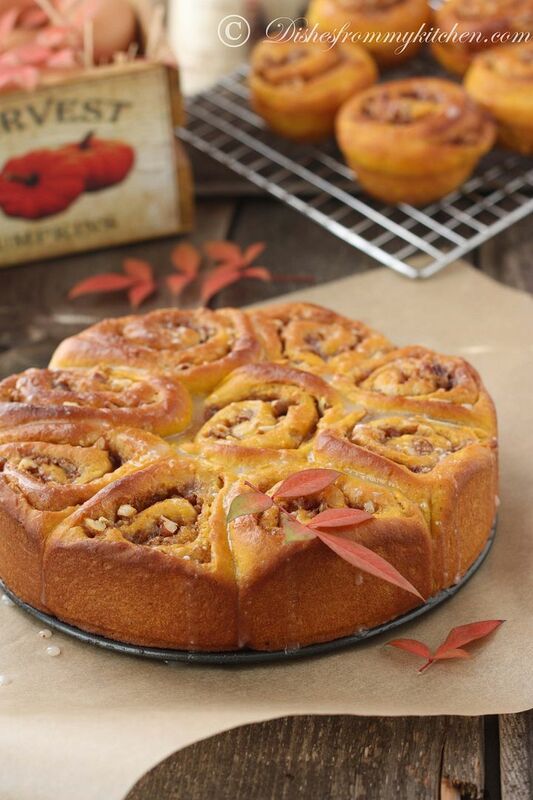 Just shared this recipe on my facebook page!! looks so beautiful Pavi....Love each and every click that u took. Truly impressive!!! 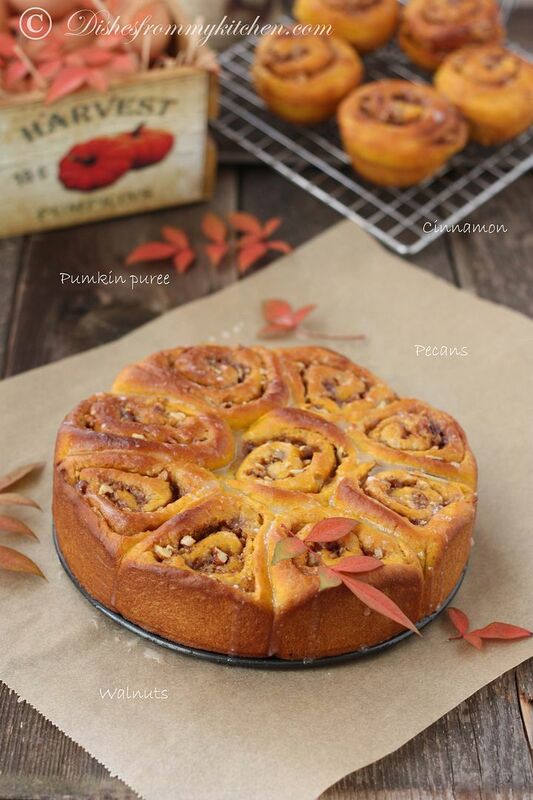 superlative clicks, delicious rolls!!! They look absolutely tempting . I want to eat them now . Anyway , Will try out the recipe and let you know . Awww. I am drooling. lovely step wise pictures with explanation. Beautiful photos. 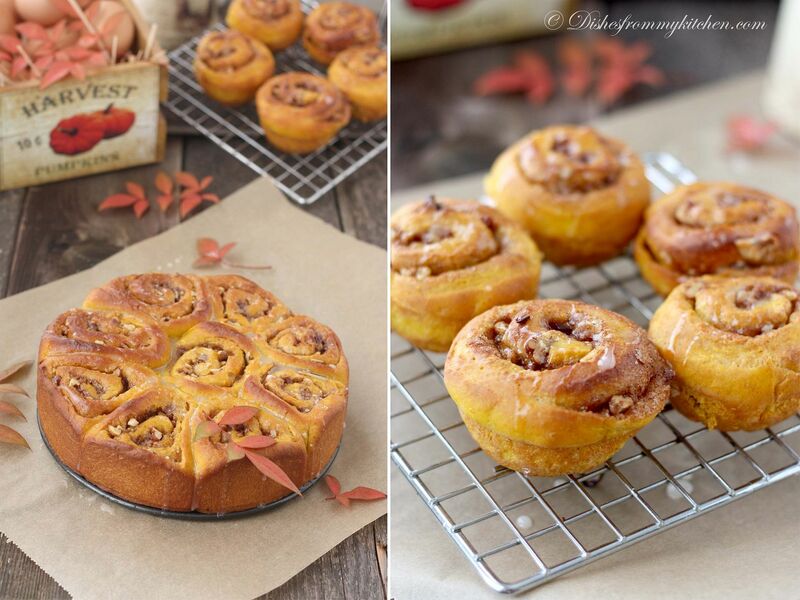 Very attractive and beautiful cinnamon rolls..Love to have some. This is a great collection of procedure photos and a wonderful final dish. 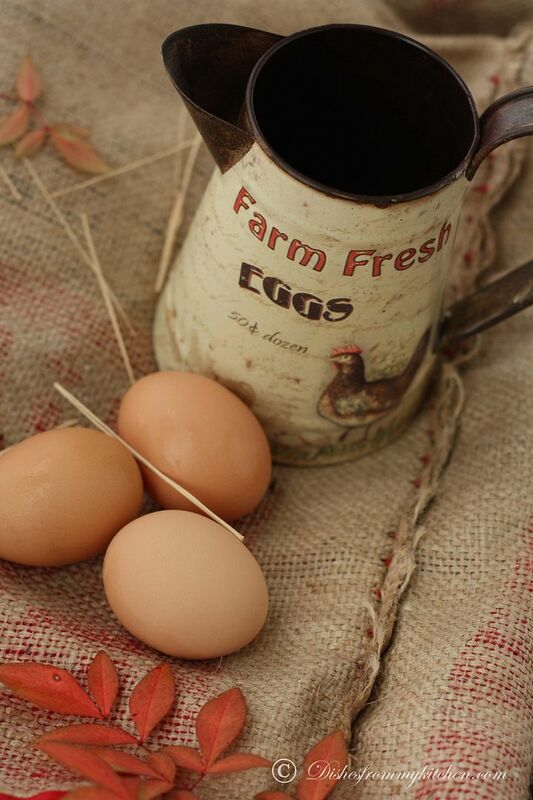 We dont eat eggs .what can I substitute eggs with in this recipe?